Featured Image: (From left) State chief secretary Basudev Banerjee, urban development minister Firhad Hakim, and Chief Minister Mamata Banerjee laying foundation for the construction of 25,000 rural roads in the state from Bhangar on Monday. 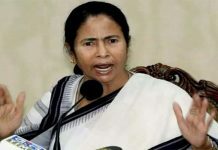 Diamond Harbour, 12 June: CHIEF Minister Mamata Banerjee today alleged that a nexus of real-estate developers, Maoist insurgents, and foreign elements was behind the anti-power transmission centre agitation that is on at Bhangar in South 24-Parganas district since January, with occasional flare-ups. “Some promoting companies have brought outsiders and Maoists to Bhangar to mislead people. 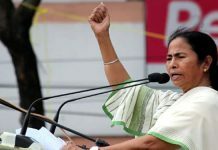 Since they want to build housing projects on farmland here, they do not want the power station to come up as electric lines would be a hindrance to high-rise,” she said addressing an administrative public meeting at Bhangar today afternoon. “Maoists have smuggled in arms-ammunition and are misleading you people in joining rallies. Showing photographs of these rallies, they are collecting money from foreign countries,” the Chief Minister said naming Venezuela as one of the countries from where donations were pouring in for Bhangar. “These people used to kill 400 humans in Junglemahal every year before we came to power, but we have stopped all the bloodshed. If you want your children to grow up in peace, please do not talk to the Maoists, reject them for good,” she urged the villagers. 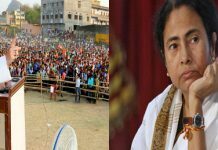 Banerjee said that she was always open to hear the grievances of the villagers on any issue, including complaints against leaders of her party, but would have no negotiations with outsiders. “Work on the stalled power transmission centre at Bhangar would resume in one minute if you the villagers give nod. You need not worry about anything, your Didi is with you,” she said. Meanwhile, Banerjee kick started the work for construction 25,000 km rural roads spread all over the state.